On average, global retail websites for consumers doing online shopping between Black Friday and the 3rd January were visually complete and ready to use within 2.5 seconds, according to a series of benchmark tests conducted by Dynatrace. 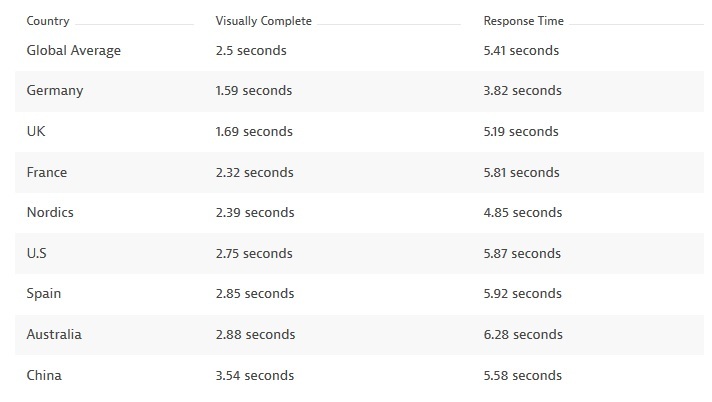 These tests measured how long it takes a web page to become "visually complete" — to appear fully loaded and ready to use from the perspective of the user. This differs from the response time metric, which measures the total time it takes for all website elements to load – including those that users can’t see and therefore don’t impact their experience. The test showed that the best online experience was found predominantly in western European countries. Consumers in Germany (36% faster), the UK (32% faster), France (7% faster) and the Nordic region (4% faster) all had consumer experiences that were faster than the global average of 2.5 seconds. The US (10% slower), Spain (14% slower), Australia (15% slower) and China (42% slower) came in slower that the global average. Methodology: Dynatrace tested the user experience of the top retail sites in eight countries every 10 minutes from November the 24th 2017 to the 3rd of January 2018. The results of this testing are outlined in the table below.